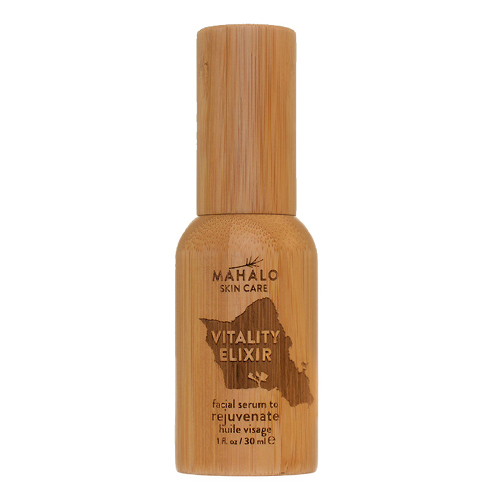 Vitality Elixir Facial Serum by Mahalo Skin Care is a serum that delivers visible results. 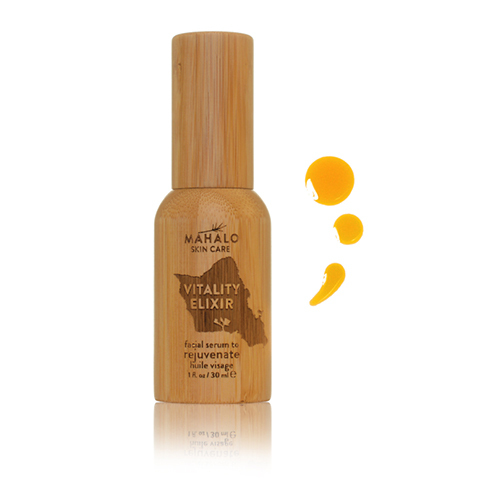 Packed with ultra-pure organic and wild-crafted superpower ingredients, this potent face serum is made with a concentrated blend of CoEnzymeQ10, immortelle, carrot seed and sea buckthorn oils, for a healthy, youthful look. A tropical combination of chia, kukui and tamanu oils lends a balanced feel to skin, diminishing signs of acne flare ups, eczema, rosacea and hormonal imbalances. Don't be fooled by the beautiful bamboo bottle, the serum inside provides a holistic and loving way to keep skin looking glowing year-round. Apply 1-2 pumps into palm of hands, gently massage elixir onto face and décolleté. Breathe deeply and relax. For an added benefit add an extra drop under the eyes to soften the appearance of wrinkles and puffiness. Can be used morning and evening. An excellent face serum for men. Other face oils, I struggle to finish. But I am sprinting through this bottle. My skin looks younger, brighter, and hydrated without being greasy. And the smell is divine. I love that it comes with a pump too. Mahalo is the best.